Emergency button to facilitate contacting emergency services. Event information (for example how to get to Thanksgiving day parade on Thanksgiving). Other information the city feels should be accessible. Microphone, speaker and webcam to facilitate communication with emergency services, TTS for those with disabilities and future uses. Extra space on panel could be advertising or boilerplate information. Above the user accessible panel would be kiosk space. LED panels would be able to show advertising and information. In an emergency the city could utilize this space to provide directions and information. For example where nearby storm shelters can be found, or amber alerts. 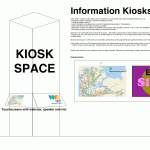 Because all info space on the kiosks are essentially screens they can be programmed and updated remotely over IP network. Each location could be a WiFi Hotspot providing short free internet access and for a small daily charge access at any other kiosk for up to __ MB for the day or other rate plans. Possibly partner with ISP’s who would offer hotspot access to their customers. Ideally kiosks would have an overhang to keep sun glare off panels. Otherwise it would be open to deter crime that phone booths saw. This plan would involve advertising revenue, internet connectivity revenue and possibly even partnership revenue via ISP’s taking advantage of the mesh network built upon this existing infrastructure in a populated area.